In 1997, 17-year-old student Daniel Malmedahl recorded audio of himself impersonating the noises produced by internal combustion engines. He posted the sounds on a website that caught the attention of a Swedish television researcher, who convinced Daniel to perform the sound live on the air. After the annoying thing debuted on TV, recordings of his performance began appearing on P2P file sharing networks and various websites under the filename “2TAKTARE.MP3″ (“Tvåtaktare” is Swedish for “Two stroker”). The sound effect was quickly included in Flash animations that spread virally among Internet users becoming an Internet phenomenon. Arguably, the most famous example was the Insanity Test, which challenged listeners to keep a straight face while staring at a still photograph of Rubens Barrichello, a Brazilian Formula One racing driver in a Ferrari Formula 1 car as the outrageous sound effect was played. In 2004, the German-based company, Jamba! Group (eventually owned by VeriSign who then sold 51% of the group to Fox in 2006) licensed the animation and sound for distribution as a mobile phone ringtone. It is arguably the most commercially successful ringtone of all time. Jamba! 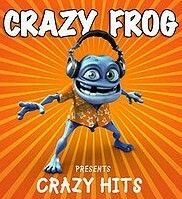 has also produced other successful animated creature ringtones, including Sweety the Chick and Nessie the Dragon, and produced other ringtones featuring the Crazy Frog including Crazy DJ Frog. There is also a series of Crazy Frog World Tour tones featuring the Frog performing his usual vocalizations against backgrounds of various countries’ musical styles. These include the sitar-based “Crazy Frog India”, reggae-flavoured “Crazy Frog Jamaica” and John Barnes-esque “Crazy Frog Australian Rock”. What do you think of the Crazy Frog Ringtone compared to the Mosquito Ringtone? Both of them got their fame from the Internet!